The Seris, or Comcaac, are a group of hunter-gatherer people from the coastal region of Sonora Mexico. They have lived in close relationship to both the desert and sea while remaining largely independent and traditional in their practices into the modern era. Having resisted subjugation by the Spanish and Mexican authorities, they retained their nomadic lifestyle until the 1950s. Only during the latter half of the 20th century did they begin to settle in towns and embrace a cash economy based on selling their hand-crafted wares and commercial fishing. The Seris remain rooted in their own language and in-depth knowledge of the landscape. 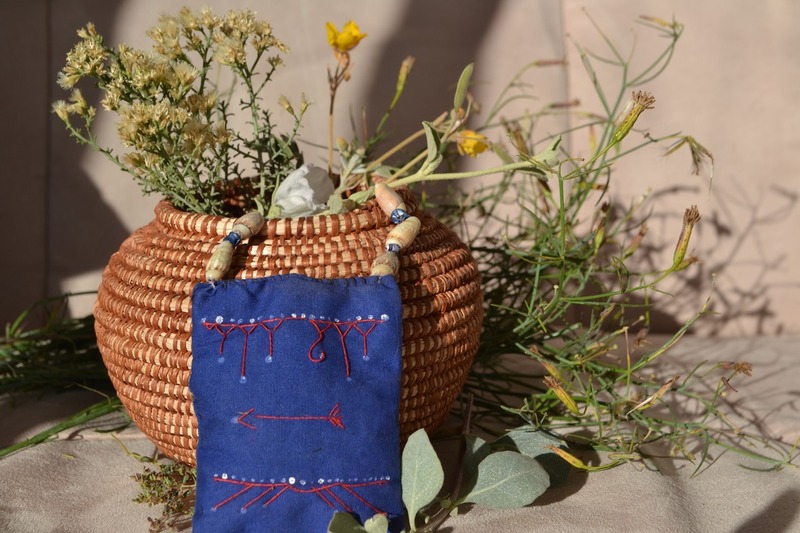 The following herbal shorts are derived from time spent in the desert hills with two Seri elders, who introduced me to many of their plants, as well as subsequent ethnobotanical research. Senna (Cassia covesii) is called he he quiinla, or ‘plant that rings’, by the Seri. This name refers to the rattling sound produced by the seed pods. The root and arial parts are prepared as a tea and used to increase appetite and clean out the digestive system. The tea is also used to support the kidneys and liver for a full body cleansing. While these applications are widely known for other species of Senna, I found other uses more interesting. The Seris also used this plant to treat the influx of modern communicable diseases such as measles and chicken pox and also to promote conception. 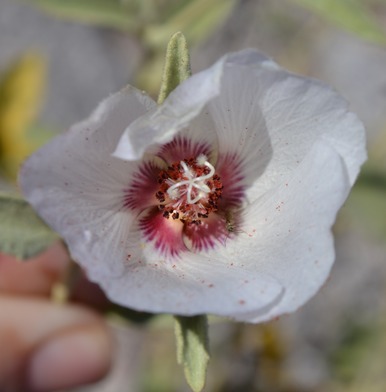 Rock Hibiscus (Hibiscus denudatus) is a lovely mallow family plant with eye-catching white flowers and red patterns emanating from the center. Its relationship to the landscape and other plants of this family is indicated by its Seri name hepemijcoa, meaning ‘white-tailed deer’s Globemallow’. Like other mallow plants, this species is prepared as a tea and used as a gargle for phlegm, mucus, and sore throats. Atriplex barclayana is a smaller species related to our own locally abundant Four-Wing Saltbush (A. canescens). Called spitj by the Seris, I could not find any common names in English or Spanish which suggests that this plant is not widely used in other herbal traditions. The Seris, however, turn to A. barclayana combined with Bursera microphylla (Torote or Elephant Tree) for the treatment of stingray wounds. The would is bathed in a tea made from twigs and leaves of both species. Traditional uses also included covering the ground with leafy branches while tanning deerskins and using them in the construction of brush dwellings. Jojoba (Simmondsia chinensis) is a shrub well-known outside of Seri territory and is a beloved oil included in many commercial and home-made body products. Called pnaacol by the Seri, it provided for hair products as well as medicine and hand-crafted objects. Ground seeds were used in shampoos made with shaved twigs of Elephant Tree (B. microphylla) and the seeds were also rubbed into hair and scalp and washed out to encourage hair growth. As a medicine, the seeds were heated in hot ashes, removed, and crushed on a metate to produce an oil that was applied to wounds. The ground seeds were also put into a cloth, squeezed, and the liquid used as eye drops. Additionally the raw green seeds were chewed to alleviate sore throats. Seri necklaces may be decorated with Jojoba seeds and the hardwood was also traditionally used as meat skewers. Euphorbia polycarpa, also known as Spurge, Golondrina, or tomitom hantcocpetij, is a low-lying weedy ground-cover common in many bioregions. Despite being toxic, the Seris use this plant as a readily available medicine with both topical and internal uses. The fresh green leaves are mashed with salt and oil to make a poultice applied to swollen areas of the body. It is also used internally combined with Brittlebush (Encelia farinosa) and Asclepias as a remedy for toothache and heart pain. Blue Palo Verde (Parkinsonia floridium) and Foothills Palo Verde (P. microphyllum) are common trees and large shrubs of the Sonoran desert, remarkable for their green photosynthesizing bark. They are also an important providers for the Seri way of life giving coveted desert shade, seeds used in necklace-making, pigments for face-paint, firewood, and wild food. The seeds were winnowed, dried, toasted, and ground into flour that was traditionally cooked with honey and sea turtle oil. The green pods were also cooked with meat and the flowers of some trees were also eaten. The Seris know this plant so intimately that they differentiate between those without spines and edible flowers (called ziij) and those with spines and bitter tasting flowers (iiz). Cardon and the cactus landscape: The great cactus forests of Sonora are an amazing sight to behold. Their alluring magic calls the traveller off of the roads and into the true world of enduring desert vitality. This is a rare place where three of the great columnar cacti coexist: Cardon or Sahueso (Pachycereus pringlei), Sahuaro (Carnegiea gigantea), and Organ Pipe or Pitaya Dulce (Stenocereus thurberi). Here one will find many of the major wild plant food sources of desert-dwellers. Fruits from these and other cacti provided an abundant source of sugar as well as protein and oil from seeds that were crushed, cooked, and salted for maximum absorption of nutrients. The seeds of Cardon fruits were considered to be so highly nutritious that they were worthy of recycling by means of defecating on desert rocks, drying, re-harvesting, washing, cooking and consuming a second time. The Seri were so closely connected to the Cardon forests that their territory matches almost precisely with that of Cardon’s range and they distinguished three types of Cardon plants based upon variations in spines and fruits as well as four colors of fruits produced by the species. Mothers also planted the placentas of their children at the base of Cardon cactus plants and many people would make visits to these sacred places later in life. They were also considered to be a source of good luck when offerings such as clam shells were made to the cactus. Cardon and other columnar cacti also served as materials for everyday objects such as walking canes and cactus fruit harvesting poles. Seeds were also used in tanning deerskins and the juice was mixed with charcoal for tattooing. Other important cacti of the region include various species of Hedgehog (Echinocereus spp. ), Barrel (Ferocactus spp. ), Fishhook (Mammillaria spp. ), and a large assortment of Cholla and Prickly Pear (Opuntia spp.). To learn about desert aromatic plants at the center of Seri herbal practice, look for my expanded essay “Desert Aromatics and Plant Ways of the Seris in Sonora Mexico” in the 2015-2016 Plant Healer Quarterly, 6(1). Also see the book People of the Desert and Sea: Ethnobotany of The Seri Indians by Richard Felger and Mary Beck Moser, published by University of Arizona Press in Tucson, 1985. This entry was posted in ethnobotany, herbal medicine, herbalism, herbs, native plants, Sonora and tagged cactus, cardon, desert, herbal medicine, Jojoba, Palo Verde, Sahuaro, Senna, Seri, Sonora on January 6, 2015 by darasaville.